There is a myth that the word ‘kangaroo’ derives from the reply that Aboriginal Australians gave meaning “I don’t understand” when the British asked for the name of the animal. As the story goes, the British mistook that reply for the name of the animal, and it stuck. It’s a good story that is often repeated, but it is not true. In 1770, the Endeavour, captained by Britain’s James Cook, docked in the northeastern coast of Australia. It was near the present site of Cooktown, named for the explorer. Cook’s journals include a list of scores of words used by the Aboriginal Australians they encountered on the coast. They spoke a language called Guugu Yimidhirr, which is spoken as the mother tongue by only about 780 individuals today. ‘Guugu Yimidhirr’ is the name in the modern spelling, but in the past it was written as ‘Koko Yimidir’, ‘Koko Yimidjir’, etc. In Cook’s word list, kangaroo appears as ‘kanguroo’. ‘Kanguru’ and ‘kangooroo’ were other variant spellings used, but today English has settled on ‘kangaroo’. According to a study in 1974 (“A Last Look at Cook’s Guugu Yimidhirr Word List”, Oceania 44: 216–232) by linguist John B. Haviland, in modern Guugu Yimidhirr, ‘gangurru’ or ‘ngurrumugu’ refers to a large, black species of kangaroo that is now rare. There is a large species of kangaroo found in northeastern Australia, the eastern grey kangaroo (Macropus giganteus), but it is not rare, so it isn’t clear which species he refers to. In any case, the word Cook recorded definitely referred to a kind of kangaroo, and the story that it was a phrase meaning “I don’t understand” is false. The pronunciation of the word in the original language is somewhat different from the pronunciation of ‘kangaroo’ in English. In Modern Guugu Yimidhirr, ‘gangurru’ is pronounced [ɡaŋʊrʊ]. Like many Australian languages, Guugu Yimidhirr lacks the distinction between voiced and voiceless stops. It has no phoneme /k/, only /ɡ/. Nowadays, such Australian languages have standardized spellings that use only the voiced letters ‘b, d, g’ or only the voiceless letters ‘p, t, k’, but in the past they were often transcribed with a mix of such letters based on what they sounded like to Europeans. Just as Guugu Yimidhirr was once written ‘Koko Yimidir’, Cook wrote ‘kanguroo’ with a ‘k’. Perhaps word-initial /ɡ/ was pronounced as a voiceless [k] as in Korean. In Cook’s spelling ‘kanguroo’, ‘ng’ was meant to represent the sound /ŋ/ as in ‘singer’ [ˈsɪŋəɹ]. However, the same spelling can also correspond to /ŋɡ/ as in ‘finger’ [ˈfɪŋɡəɹ]. So English speakers inserted a /ɡ/ not in the original language when they saw the spelling ‘kangaroo’, despite the pronunciation intended by Cook. Also, because the ‘a’ in ‘ang’ is pronounced /æ/ in English when not followed by ‘e’, the ‘a’ in the first syllable became /æ/, and the vowel of the middle syllable, which had no stress in English, became the indistinct /ə/, resulting in [ˌkæŋɡəˈɹuː]. Because of this indistinct vowel in the middle syllable, the spelling ‘kangaroo’. The forms of the word used in other European languages mostly follow the former English spellings ‘kanguroo/kanguru/kangooroo’ in the treatment of this vowel. So we have French kangourou [kɑ̃ɡuʁu] and Portuguese canguru [kɐ̃ŋguˈɾu]. German has Känguru [ˈkɛŋɡuʁu] and Danish kænguru [kʰɛŋˈɡ̊uːʁu], where the English /æ/ is imitated with /ɛ/. In Swedish, the ‘k’ changes pronunciation before the front vowel /ɛ/ to give känguru [ˈɕɛŋːɡʉrʉ]. Because Finnish doesn’t have /ɡ/ in native words and the spelling ‘ng’ corresponds to /ŋ/, it has kenguru [ˈkeŋːuru]. Dutch also usually maps English ‘a’ /æ/ to /ɛ/, but kangoeroe is pronounced [ˈkɑŋɣəru], perhaps due to French influence. Dutch ‘g’ usually represents the fricative /ɣ/ except in recent loanwords. In Russian we have кенгуру kenguru [kʲɪngʊˈru]. Since Russian does not normally map English ‘a’ /æ/ to е e, this form must be from German. Meanwhile, Spanish has canguro [kaŋˈguɾo] and Italian has canguro [kaŋˈguːro], and Greek also has καγκουρό kagkouró [kaŋguˈro]. The English spelling ‘-oo’ was interpreted as [o], which is understandable as English is one of very few languages where ‘oo’ represents [u(ː)]. Based on this survey, ‘kangaroo’ seems to have become the preferred form in English after forms such as ‘kanguroo/kanguru/kangooroo’ were spread to other European languages. 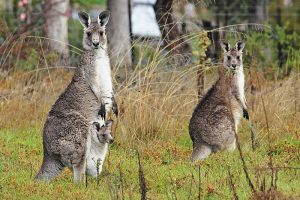 The languages that have forms similar to ‘kangaroo’ today seem to have adopted them relatively recently from English. Welsh cangarŵ [kaŋɡaˈruː] and Hindi कंगारू kaṃgārū [kəŋgaːˈruː] are some examples.  Korean has 캥거루 kaenggeoru [kʰɛŋɡʌɾu] in the South, with English /æ/ and /ə/ approximated with /ɛ/ and /ʌ/ respectively, although the North Korean spelling is 캉가루 kanggaru [kʰaŋɡaɾu] which uses /a/ for both vowels spelled ‘a’. Japanese has カンガルー kangarū [kaŋɡaꜜɾɯː]. Malaysia and Indonesia both have Malay as the official language, though in Indonesia it is called Indonesia (Bahasa Indonesia). But the Malay used in formerly British-ruled Malaysia uses ‘kanggaru’ [kaŋɡaru] while the Malay/Indonesian in formerly Dutch-ruled Indonesia uses ‘kanguru’ [kaŋuru], due to the English and Dutch influences respectively. Afrikaans, used mainly in South Africa, developed from Dutch but uses ‘kangaroe’ [kɑŋɡəˈru(ː)] in contrast to Dutch which uses ‘kangoeroe’ [ˈkɑŋɣəru]. The ‘a’ in the middle syllable could be due to English influence. However, despite the different spellings, ‘a’ and ‘oe’ are pronounced as the indistinct unstressed vowel [ə] in both languages. The Afrikaans form with ‘a’ could therefore conceivably be an internal development independent of English influence. However, Afrikaans speakers have historically been in contact with English speakers, and today English is realistically the most influential of South Africa’s twelve official languages and one that most Afrikaans speakers learn. So English influence is probably the main cause here. Consider also that Dutch pronounces the ‘g’ as the fricative /ɣ/ while Afrikaans uses the stop /ɡ/ as in English. In both Dutch and Afrikaans, the stop /ɡ/ is only used in recent loanwords, with replacement by the native fricative /ɣ/ (in Dutch) or /x/ (in Afrikaans) increasing in more established loanwords. Guugu Yimidhirr was just one of hundreds of languages spoken in Australia before the arrival of Europeans, but because James Cook and the Endeavour happened to dock in an area where it was spoken, it gave the world the word ‘kangaroo’, even if the pronunciation was altered through the prism of English spelling. The Australia language that provided the most words to the world’s dictionaries may be Dharug, spoken in the area around today’s Sydney; it is responsible for the names of animals such as ‘koala’, ‘wallaby’, ‘wombat’, and ‘dingo’ as well as ‘boomerang’. But the quintessential Australian creature, the kangaroo, is called by people all over the world names that ultimately come from a language used in a tiny corner of northeastern Australia, Guugu Yimidhirr, that today has only around 780 native speakers.